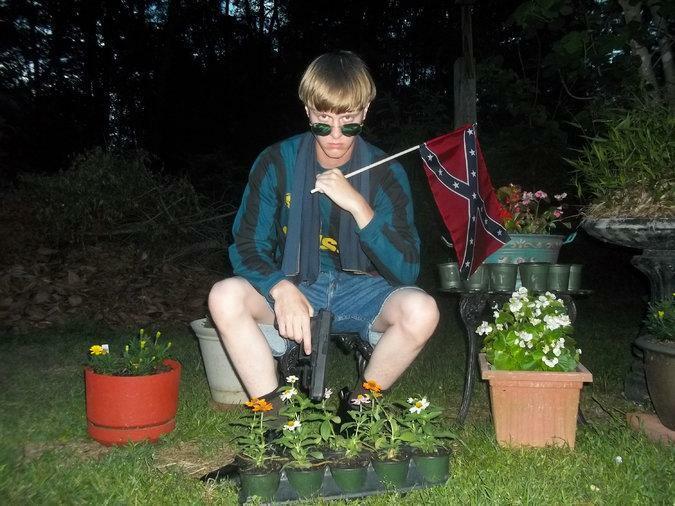 Dylann Roof posed with a Confederate flag and a gun in a photo posted on what appeared to be his website. COLUMBIA, S.C. — Dylann Roof spat on and burned the American flag but waved the Confederate battle flag. He posed for pictures wearing a No. 88 T-shirt, had 88 Facebook friends, and wrote that number — white supremacist code for “Heil Hitler”— in the South Carolina sand. A website discovered Saturday appears to offer the first serious look at Roof’s thinking, including how the case of Trayvon Martin, the black Florida teenager shot to death in 2012 by George Zimmerman, a neighborhood watch volunteer, triggered his racist rage. The site shows a stash of 60 photographs of Roof, many at Confederate heritage sites or slavery museums, and includes a racist manifesto in which the author criticized blacks as being inferior while lamenting the cowardice of white flight. The website was registered Feb. 9 in the name of Dylann Roof, the 21-year-old man accused of entering a black church in Charleston on Wednesday night, attending a prayer meeting for an hour, and then murdering nine parishioners. The day after the site was registered, the registration information was intentionally masked. “How do you address, basically, what was in this awful person’s heart? ... I think for our country, a continued dialogue about race,” said the city’s mayor. It is not clear whether the manifesto was written by Roof or whether he had control of it. Nor is it clear whether he took the pictures with a timer or whether someone else took them. The FBI and Charleston police officials say they are examining the site. But if it is genuine, the tourist sites he visited, the pictures that were posted, and the hate-filled words filling the site offered a chilling glimpse into the interests of an unemployed high school dropout said to have a fixation on race and a murderous rage. 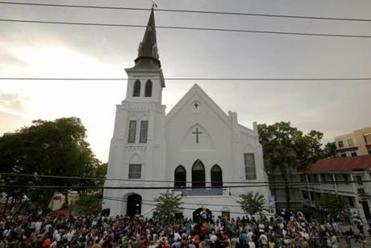 Roof, who is accused of being the lone gunman who entered the Emanuel AME Church on Wednesday night and unleashed a murderous rampage with a .45-caliber handgun, has been charged with nine counts of murder in connection with the killings. Victims included the Rev. Clementa C. Pinckney, who was both the pastor and a state senator. Roof, who was first identified by surveillance footage released the morning after the killings, is being held at the Charleston County jail, along with a North Charleston police officer charged with shooting an unarmed African-American motorist in the back in April. Roof’s friends say that he only spoke of his racist leanings once — when he recently warned that he planned to do something crazy with the gun he had purchased with the money he got from his parents for his 21st birthday. But they say he was bothered by the uproar surrounding the Trayvon Martin case. The website, lastrhodesian.com, features a photo of a bloodied dead white man on the floor. The picture appears to be a shot from “Romper Stomper,” an Australian movie about neo-Nazis. It was first discovered by a blogger who goes by the pen name Emma Quangel. In one picture, Roof is shown posing with wax figures of slaves. In others, he posed with a handgun that appears to be a .45-caliber Glock. He had a .45-caliber Glock in his car when he was arrested Thursday, police said. Roof is alone in all of the photos, which show a slave plantation; Sullivan’s Island, S.C.; and the Museum and Library of Confederate History in Greenville, S.C. He sports the same gloomy look in many of the photos, but others depict nature scenes and vacation photographs. The letter H is the eighth letter of the alphabet, so 88 is a known code for “Heil Hitler.” The website’s links contain several passages of long racist rants, saying Hispanics are enemies and “Negroes” have lower IQs and low impulse control. The writings are not signed. The manifesto discovered Saturday uses defamatory terms for blacks, whom he accused of being “stupid and violent” with “the capacity to be very slick.” It laments white flight and suggested that the whites should instead stay behind in cities and fight. Brown said his friend’s transformation appeared to have occurred after he transferred to a new high school. “He wasn’t putting on Facebook, ‘I hate black people. I am going to shoot up a church,’ ” Brown said.